On 19 August Sr Lily Scullion, from St Mary’s Abbey, Glencairn, Co. Waterford, will join the all-female silage crew which will mow, rake and draw 30 acres of silage at Mount Melleray in aid of the Alzheimer’s Society. 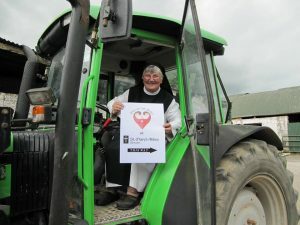 A Cistercian nun is to join 40 women who plan to set a Guinness World Record and raise money for charity by cutting silage. On 19 August, Sr Lily Scullion, from St Mary’s Abbey, Glencairn, Co. Waterford, will join the all-female silage crew which will mow, rake and draw 30 acres of silage in aid of the Alzheimer’s Society. The event is being held at Mount Melleray Abbey farm, home to Cistercian monks, and 12 miles from Glencairn. The monks there have leased their farm to Daniel O’Donnell, who has donated more than 30 acres of his grass to the fundraising event. Sister Lily is no stranger to farming and tractor work, as she has run the 200 acre farm at Glencairn Abbey for a number of years. She will bring her own Deutz tractor to join the group which has become known as the ‘Grass Gals’. However, she will have to have a crash course on silage making, as she has not done it before. She has done ‘topping’, which involves trimming back tall grass to stimulate growth. “This is drawing a trailer behind the tractor and catching the grass as it comes up the chute [of the harvester],” she explained. She said that the organiser John O’Brien has raised funds for cancer charities in the past. The sisters themselves have also completed an extensive renovation at the Abbey, and fundraising to pay for that continues. The Abbey farm includes 40 acres under natural woodland. The rest of the land is used for rearing B&B cattle, 50 suckler cows, and calves of the Saler breed. Sheep are also reared on the farm, and the 23 ewes produced 39 lambs this year, including a set of triplets. The sisters nearly gave up sheep, but the Abbess, Mother Marie Fahy, who is a trained midwife, offered to help and she and Sr Lily oversee all the lambing now. The farm also includes some tillage and an energy crop, miscanthus (elephant grass). Since the sisters installed a biomass boiler, they have never looked back. After putting the first bale of miscanthus into the boiler and lighting it, Sr Lily felt a wave of heat as she returned indoors. As the Abbey has been under renovation, she cannot yet make a proper cost comparison with oil which previously heated the Abbey, but she and all the other sisters are in no doubt that it is warmer than ever. The crop was not without controversy, as Sr Lily went public in 2013 when turned down for LEADER funding for what was to be a green energy education project, because the project was seen as “furthering religion”. 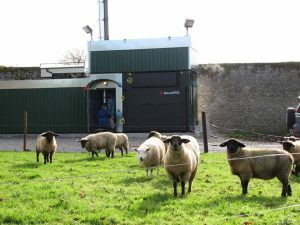 Sr Lily and Teagasc (farm advisory body) had proposed installing the miscantus burner to heat the Abbey, with open days and demonstrations for farmers and those interested in burning miscanthus grown on local farms. The funding authorities expressed doubts as to whether the sisters could open their doors to the public for the demonstrations. However, St Mary’s is no stranger to visitors. For example, it threw open its doors to the foodies attending the Waterford Festival of Food in 2009 and hosted the ‘Abbey’s’ bus tour which was booked out weeks in advance.